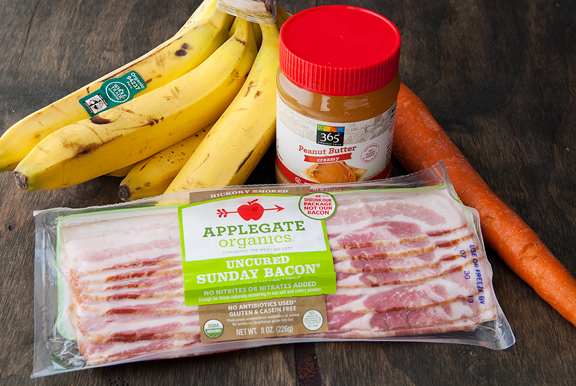 Before you chide me for feeding my dog organic Sunday bacon, let me state that the bacon is for us (the people) and that I only chopped up 2 slices for her treats. All of the ingredients are things Kaweah loves. Maybe your dog is more of a cookies and cream type of pup? 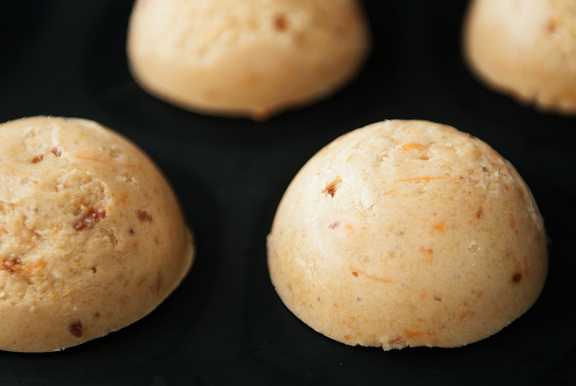 Crumble some dog biscuits and stir them in. Who doesn’t love mix-ins? 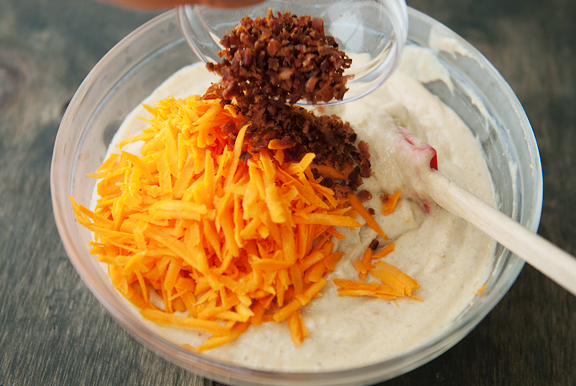 Mmmmm, mix-ins…. Because it was so dang hot in my house, the “ice cream” base was melting quickly. If you want to see what the whole process looks like, please go to this post. 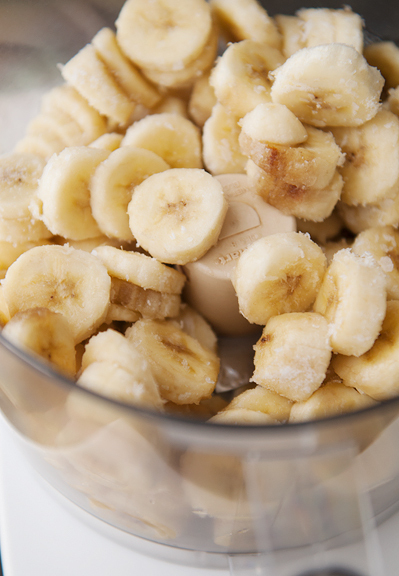 You can use a food processor or a blender, although the less powerful blenders may need a little liquid to coax the bananas along. Add whatever you feel comfortable giving your dog: water, milk, almond milk, beef broth (hey – the dog is eating it, not you). As for how to freeze the ice cream, I made a half dozen hemispheres in my silicone bombe molds and had enough leftover to fill two glass ramekins. Do whatever works for you in terms of dog safety (no popsicle sticks for Kaweah because she WILL eat them) and mess factor. Kaweah was so excited when I made these that she was underfoot the entire time and panting like a maniac, because she pants in anticipation of two things: 1) beef and 2) anything that she’s pretty sure is for her. 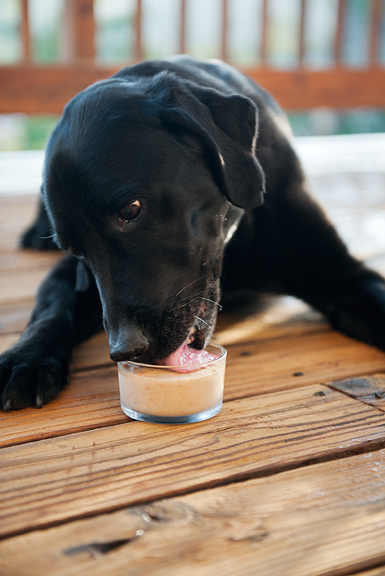 We gave the pup one of the ramekins on the deck after her half-dinner (we call them halfie meals). She ate that thing like it was her JOB. I actually like the ramekin because we let her eat a fraction at a time. When we take it away from her, we just pop it in a ziploc bag and chuck it back in the freezer. I’ll probably put the hemispherical bombes into a ramekin too for ease of slobber containment. Note: The add-ins and flavorings are entirely up to you, but bananas are the base of the “ice cream”. Please, don’t add things like chocolate, grapes, or other ingredients that are toxic or dangerous for dogs! Peel the bananas and slice into 1/2-inch thick disks. Place the slices in a bowl or ziploc bag and freeze the slices solid (about 2 hours or more, depending on the enthusiasm of your freezer). 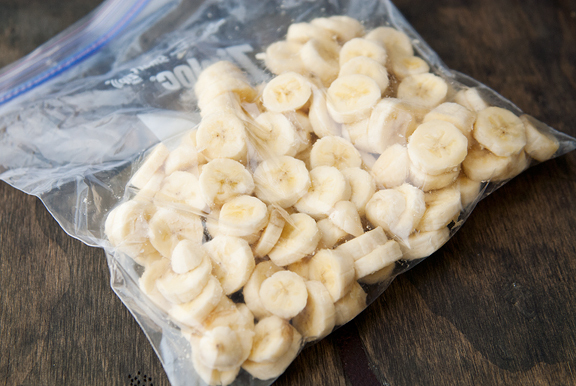 Place the frozen slices of banana into a food processor or a blender and pulse to break down the fruit. This will require scraping down the sides of the bowl often, but keep doing it because the bananas will eventually become a soft-serve consistency. 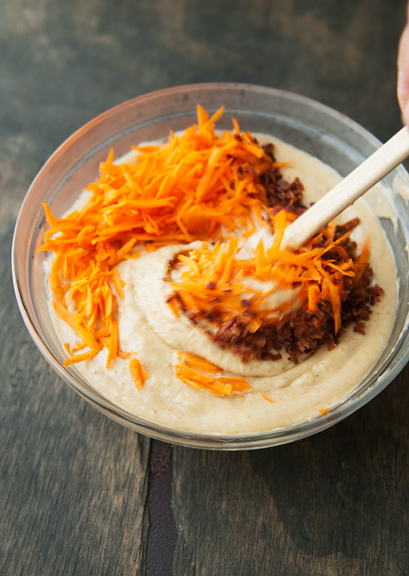 If using a blender that just spins its blades, you can add a little liquid (milk, almond milk, water, juice – no grape juice!, beef broth) to help it along. 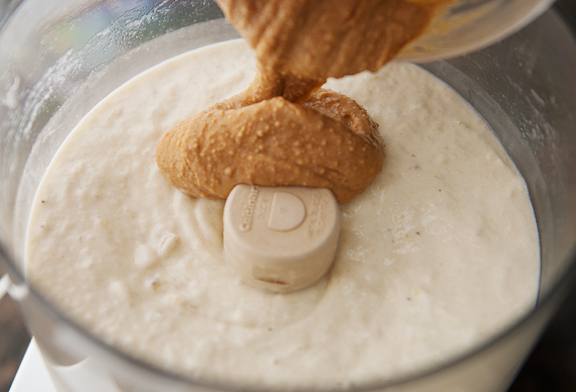 When the ice cream is smooth, add the peanut butter (if using) and blend for a few seconds to incorporate. 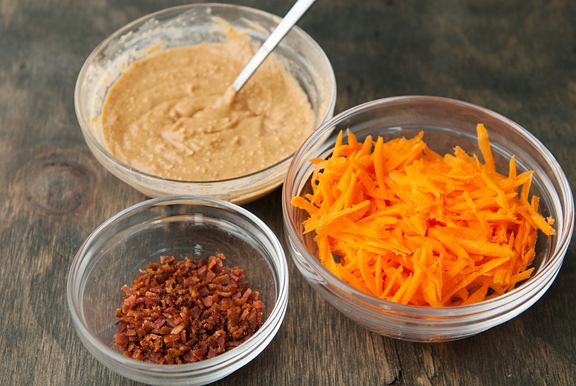 Stir in the carrot and bacon (or other mix-ins). 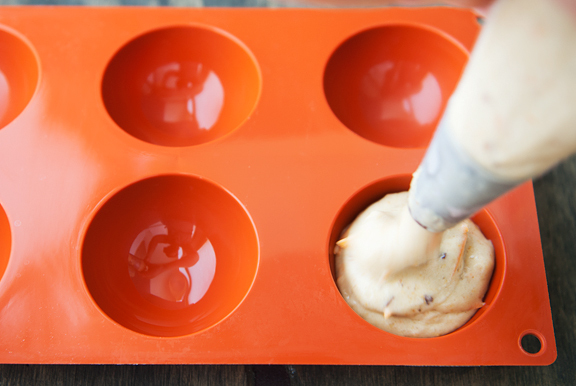 Divide the soft ice cream among ramekins or shallow vessels and freeze. Makes 3 cups of ice cream (about 6-8 ramekins). Kaweah looks very pleased with her treat! Slobber containment….snicker. So how do you think she knows when you are cooking for her? Do you talk to her more? Give some sort of nonverbal signal? Or is it just that she’s really hoping those particular smells are going to be something for her? One of our cats gets super excited when we make toast because he’s hoping he can sneak his way into the butter. The other hangs around when we make sandwiches, hoping for some turkey or cheese. Ooooh! I’m gonna make a variation on these. Also fun, if you’re not already doing it, is to stuff a kong with treats, then immerse it in a slurry of broth/pb/yogurt, etc in a quart yogurt container and freeze it. 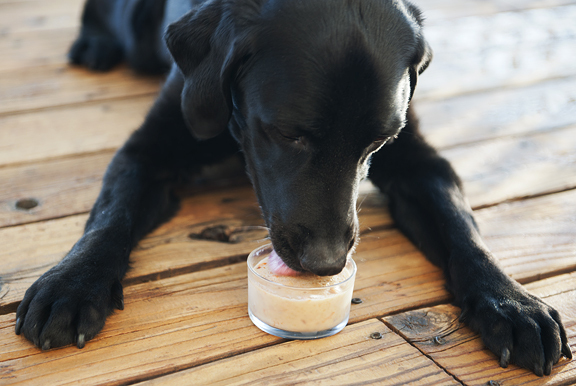 Then turn the treat-embedded ice cube out onto the deck or in the yard and let her work it. Kaweah does look very focused. 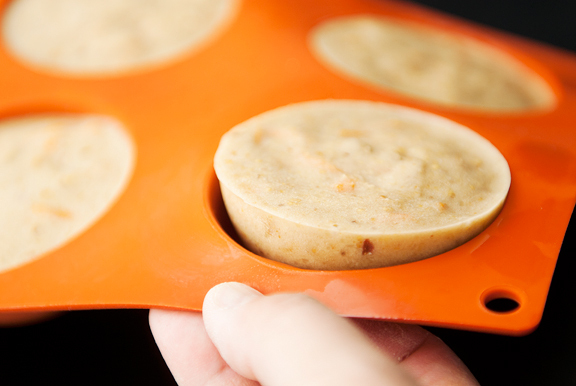 I might just have to make this treat for the human beasts in my house (minus the carrots, but possibly with a swirl of chocolate) I do like the idea of using the silicone muffin tins for portion control. Genius! That’s about all of my dogs favorite things in one delicious treat, I’ll be giving this a try soon, thanks for the idea! Totally making these for my neighbor’s dog…..he bit a guy trying to break into my house and deserves a good treat! What a lucky dog! I wonder if my puppy would like these? At least they would be better than dirt clods and rocks he seems to fancy. That’s one beautiful doggy… I’m in love w/her paws…. my mom’s maltese will turn 15 this year, and there are days we can hardly believe it because she still has her moments where she is pure puppy! We treasure every moment w/her, and now I must make her some of this ice cream! get cool. What a lucky dog. I’m making these for me! Have a great weekend everyone! What a sweetie. She deserves those delicious treats! I’d make them for my dog if 1)it ever got hot here and 2)we had some outdoor space where she could eat it. Oh well. My dog will have to live vicariously through your dog. What perfect coincidence….today is Oscar’s birthday! He passed away last year at 14. He was a fine, old dog…half german shepherd/lab mix. Bad when he was a puppy but a graceful old soul in his later years of life. We should celebrate and enjoy our furry kiddos when they are still with us….cheers! I’m sure my sister will be making these for her geriatric chocolate lab! These look scrumptious for my K-9 Kompanion! I am a mom to a 3 month old Beagle / Rottie mix. She certainly enjoys her treats. I think this would be a great treat to cool her off during our hot summers at the Jersey Shore! Can’t wait to try!!! Magda – yeah… I was surprised to learn of it, but the results can be pretty awful for the puppy. And yes, Kaweah LOVES these frozen pupsicles! Kristin – I’m guessing it’s the peanut butter since we don’t use it that often for our own food. The moment she smells it, she appears in the kitchen and hangs out until she gets something. Your cats are hilarious. m – yes, the single-ingredient ice cream is a HUGE hit with people too. Mai-Lis – hope they liked them! angelitacarmelita - so sweet. Elderly pets deserve extra lovin'. hungry dog - Kaweah will do her utmost to eat her share for your dog too. 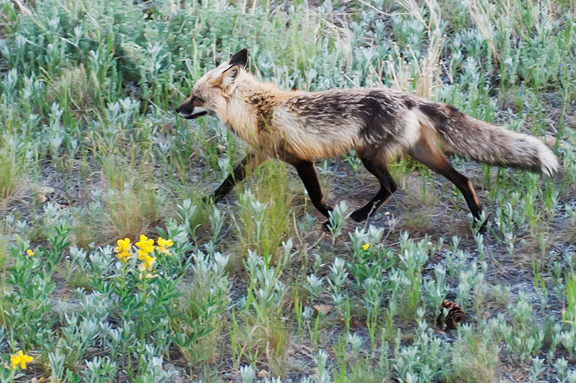 Rocky Mountain Woman - she definitely does. She still points at the freezer even after she eats one! Mary - yes, it's so nice to give them something cool to enjoy. I would give Kaweah ice, but she completely ignores it. So I have read your blog for a LONG time. But I never stopped to ponder how you pronounce your dogs name until now. Can you phonetically spell it out for me? And I was about to chide you for amazing bacon being fed to the dog. How did you guess I might say that? Then I read that she only got a little and then I was okay with that. Ha! not that you should give a rats behind what I think… Just thought it was funny.